Thanks to intueri for this post. Thanks to David Rothman for his post (click here) on VisualDxHealth. I like the site (click here) and am hoping to add their content to our patient information collection! I’ve embedded the webcast that appears on the homepage today. I don’t think this format is typical of the site (it squeezes two minutes of normal speech into 60 seconds – which makes it sound way too speeded up). I’m just experimenting to see how this might look in a few places on the new TRIP! When we moved to free access just over 12 months ago, we naively thought that advertising revenue (from Google Ads) would be fairly lucrative. By going free-access we reasoned (rightly) that traffic would grow. This extra traffic, we thought, would ensure a dependable income. In September, TRIP was searched over 500,000 times, our income from Google ads was pitiful! Hardly inspiring! The majority of the adverts are aimed at general internet users – as opposed to our predominantly clinician user-base. It’s not just TRIP that struggle to make revenue from adverts. 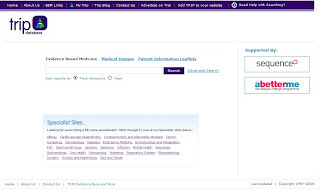 Take the BMJ site, one of the most viewed clinical sites on the web. Most of the adverts on their homepage is highlighting other BMJ products e.g. BMJ master classes, BMJ learning. What I don’t understand and I hope someone can explain, is why there aren’t any better solutions! On one hand we have pharmaceutical companies with deep pockets desperate to get their message out to clinicians. On the other hand we have a significant number of sites, mainly used by clinicians, keen to boost their income and happy(ish) to accept adverts. Why the post? I’m hoping someone will read it, knock some heads together and devise a decent system that will relive the pharma companies of some of their advertising monies and in return allow them to place their message so that it’s viewed by clinicians. I can only see this as a ‘win win’. As sites get more complex, so do the design issues! We may well have got most of the technology right, but we’re still battling to get the design right. How do users of TRIP get to know that the specialist sites exist? Should the specialist site look like TRIP or do they need their own identity? If you go to one specialist site, how likely are you to move to another specialist site? How should you navigate, consistently, between sites? One of the big issues about design and websites is making the functionality ‘there’. So if a user need to use/activate a function it is easily ‘findable’. However, you have to balance the findability of the function with the relative importance. It makes sense to have the search box displayed prominently but there is little point having the link to this blog equally prominent. At the bottom of the post is a mock-up of the new homepage. Will it still be like this at launch, we’re not sure. So we’re trying to get the balance right. One thing we won’t do is rush to meet some self-imposed deadline to have the new site ready and launched. We may still get the site out by the end of the week, but only if we’re happy. As part of the new launch TRIP will be releasing around 30 specialist search engines, ranging from Allergy to Urology. Users searching the specialist TRIPs will simultaneously search the core TRIP content plus the last 5 years articles from top 10-15 journals in that speciality. But what is the rationale? We know that restricting searchers to only ‘evidence based’ material (secondary reviewed material) would only answer around 20-25% of the clinical questions. It was for that reason that TRIP added more material (core primary research, eTextbooks etc). Our aim is to allow clinicians to answer their questions using the best available evidence. We do this pretty well with only 15% of our users saying they find the material they’re after less than half the time. Another 19% find information around half the time. So what happens to them? Do we send them to Google? PubMed? both have advantages but generally they’re unlikely to help a busy clinician! TRIP – very few relating to anaesthetics. Anaesthetics TRIP – over 200 new results, most related to anaesthetic awareness, large number of the top 20 results pertinent to the topic and from major anaesthetics journals. Pubmed – 47,201 results, non of the top 20 relate to anaesthetics! The above is a clear example of the superiority of allowing key specialist material into a search. We’re not claiming that it will as clear cut in every search, but there will (generally) be a new chunk of pertinent material. This is just the first step, I have no doubt they’ll evolve over time! It looks as though all the work should be completed towards the end of next week. Making the deployment likely sometime in the week starting 15th October.